I started a little rant over on that Twitter thingy today. Since I have way more than 140 characters here, and plenty of time too, let me explain with a little more detail. If you've never been on Twitter, you might think what I'm about to say is written in Martian. But every Friday, tons of people step out and start this #FF or #FollowFriday spam to unbelievable proportions! You could grow the largest, most fertile garden anywhere with the amount of crap that is put out! Now don't get me wrong, I certainly like to see my @dailybeerreview come up on people's lists, and I am appreciative that people think enough of me and/or this blog to recommend it. Those are the obvious intentions of #FF, but the lists and lists, 140 characters at a time, all day and night, IT'S SPAM! My opinion is that everyone should promote the sites and people they like and find valuable every single day, with or without the #FF, no matter. They should do it the way you see Chris Brogan or Amber Naslund or Lisa Barone do it. One by one, with a thoughtful comment. Those recommendations would be truly valuable. Here is an example of one from Amber: "@justinkownacki is adept at never excepting himself from analysis. Misunderstanding a Blog Post http://bit.ly/bQpwN9". OK. Let me show some of you thicker-skulled readers what I'd like Fridays on Twitter to look like. Here are 5 that I'd send out, for example. Feel free to follow them even though today is only a Monday! 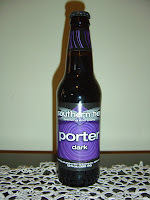 This evening I am drinking Southern Tier Porter brewed by Southern Tier Brewing Company in Lakewood, New York. The label is simple with a striking dark purple color. Ironically, the label says "dark" right on it, too. Was I brainwashed? Caramel, very malty aroma, with perhaps a touch of raisins. The flavors are more on the bitter chocolate level, with plenty of roasted and burnt malty flavors there as well. You will taste some smoky flavors as well. Medium body, low to medium carbonation, on the lightly bitter side yet still balanced. Although the burnt and smoke are a bit of a personal turn-off, it's not a bad offering. Worth checking out. Anything but a Phil(lies) fan here...lol I guess if I must I can cheer for them to satisfy your dreams of me wearing red and white pin stripes and a red hat.